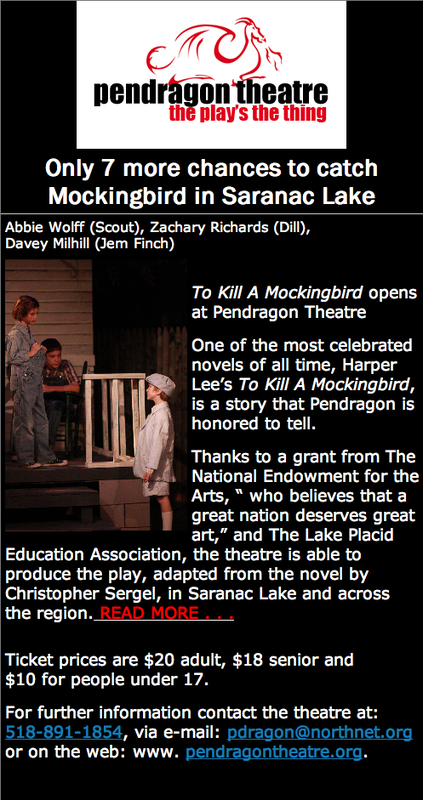 The Adirondack's only year-round professional theatre presents "To Kill A Mockingbird"
November 17,18,19, 30 at 7:00 p.m.
December 1, 2 at 7:00 p.m. 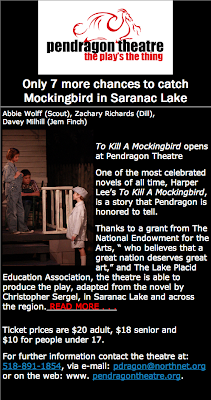 The only matinee is Sunday, December 4, at 2:00 p.m.
as a part of the Winter Carnival on February 11, 2012 at 7:30 p.m.
To Kill A Mockingbird will tour through March to schools and Arts Centers throughout the region. 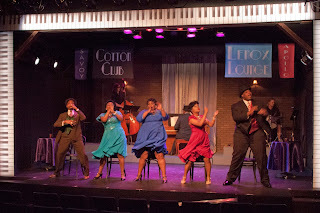 Consult the Pendragon Theatre’s website or contact the Pendragon Theatre directly for information about these performances “on the road”. Ticket prices are $20 adult, $18 senior and $10 for people under 17.
or on the web: www.pendragontheatre.org.